Welcome to my ThanksGiveaway Day! All day long I will be having giveaways going on along the theme of Children's Books and Sewing, two of my favorite things. I want to thank my readers, both new and long-time friends, for coming here to visit. I love to hear from you, but you are always welcome to just come quietly to visit. 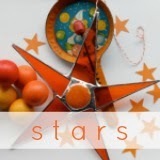 I think Etsy is the best thing that has happened to artists across the world. I know that's where to turn when I want something unique. That's where I found these amazing prints. You can visit her shop to see all her adorable prints, PolkadotStripes. Aileen is generously giving this one (my favorite) away to one of my readers in honor of Once Upon a Thread. This is how my kids read, getting out about a dozen books at a time :). I love her outfit as well. Maybe that will appear on here one day! ➊ Comment on the post to enter. Are you the type to just have one book going at a time, or do you need a book in every room? ➋ Please include your email address, if it's not linked to your profile, even if it's in the form of: nobigdillblog at gmail dot com, if you're worried about spam. Please, oh, please! ➌ You have until Sunday 11:59 pm EST to get your comment in. I was an English major in college, so would often have 5+ going per week every semester! Now I'm thankful I keep myself in gear with just one at a time. I recently did 3 at a time and it was crazy! Love that book print, so cute! My husband accuses me of having half the library at home. Always have one I'm reading, one I'm listening to when I walk and one to listen to in the car. Love to read! The print is darling! I always have a book ready for my soak in the bathtub! but can only handle one at a time. The best time of the day! These prints are unreal! I have fallen in love. At my house it takes me about six months to get through a book:( not much down time here. I have about four books going right now. I guess that means one in every room. Anyhoo, Happy Thanksgiving! Love your blog! You, along with a handful of others inspired me to start my own. Happy Thanksgiving! I usually only read one book at a time but my 8 year old reads 4 or 5 at a time. I couldn't keep it all straight! I have one next to the bed, plus one in the bathroom, and of course a collection of short stories on my phone for after the baby is in bed. Books in everyroom, books from the library, books from friends and books we own! often themed piles going on. thanks so much! love your blog! I Love Love love that little girl! (oh how i wish I could draw...) Her little shoes are amazing. I like to read one book at a time. Usually at night and usually fall asleep reading it. I'm a one-book-at-a-time kind of girl and have been ever since I was a child. I love to read! Thanks Katy! One at a time. I love to get completely immersed in a book. Those prints are so great! 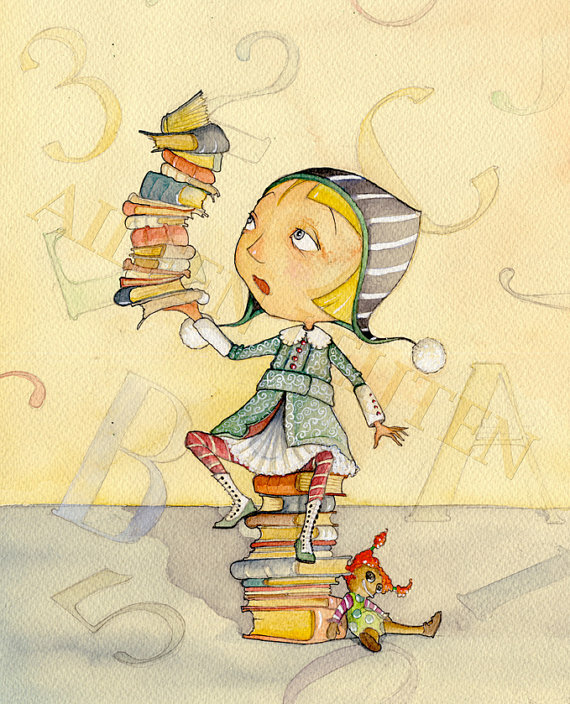 This print reminds me of my daughter, who is trying to read her height in books at the moment. She has a pile of read and a pile of unread books in her bedroom. She has more than one book at a time on the go. I tend to have an upstairs book and a downstairs book and occasionally a car book for when I'm waiting to pick one of them up. I tend to read one book at a time, but I check them out of the library in stacks of 5 or more because I'm never sure what I'll be in the mood to read next. With my kids it tends to be stacks of 10, half of which resides next to the bed for a nightly reading of two or three stories. Ooh - what a gorgeous print!!! I need to read 1 at a time because i like to completely lose myself in the story. My girls though, they are more like the girl in the print - which makes my heart very happy! oh boy. If I am reading a book, I'm not doing anything else. Sometimes that means I'm reading five at a time just get my fix, then I can go on a dry spell for a time and actually clean my house. Oh and blogger didn't save my email address so I'm signing in with my other account. Sorry! Those pictures are great! I normally only read one book at a time, but I read about 2-3 books a week, not counting the millions of books I read to my children. 3 books currently underway. LOVE absolutely LOVE the giveaway. Cute prints! We have books in pretty much every room of the house. But I am the type to only read one book at a time. I have to laugh -- my husband and I joke that we insulate our house with books. My five year old is turning out to be a chip off the old book block. She has her own bookcase, or at least shelf, in every room. And yes, she usually gets out a cool dozen at a time too. I read one fiction book at a time, but have oodles of others I pick up and put down as I feel like it... spiritual, craftsy, etc. I usually have two going at a time; a novel or something light and a spiritual/self-help type. 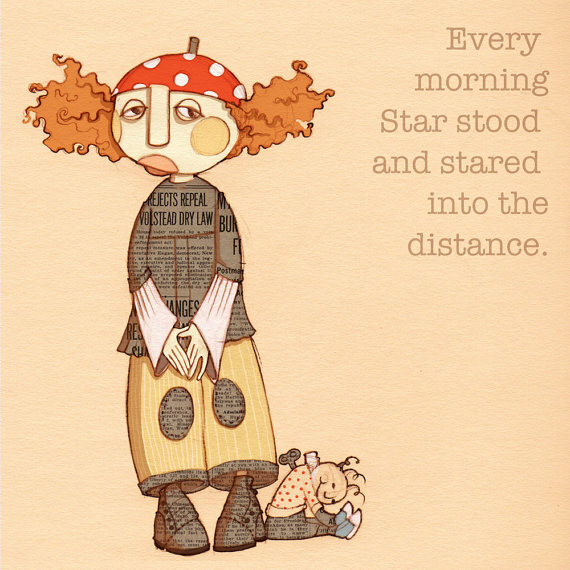 Oh, and always several children's books a day as I read to three little ones while I nurse the newborn. There are way too many good books to only have one out at a time! I am always starting a new book before finishing the old one!! I go in spurts---sometimes I have several books going at once but most of the time 1 is all I can keep up with. Those prints are adorable! I love the colors. I have always been a bookworm. I used to only read one book at a time since I devoured them and usually finished a book at the latest the day after starting it. That's why I love vacations: plenty of time to read! Love it! I'm usually one book at a time. I get too involved and need to finish whatever I am reading. I always have a million books being read at once. It makes me a little crazy sometimes. Books are in every single room of my home and I read in every single room in my home! We are a book family! The kindle is my new best thing, though. I am a one book at a time person. Oh I have a pile that I work through one book at I time! Adorable pictures! I always have a few books going. Great prints! I definitely have multiple books I'm reading around the house. We try to avoid spoiling our children, but I do believe they can never have too many books! We have heaps in every room - most of them ours, supplemented with a pile from the library each week! We love reading at our house. I'm falling in love with Children's literature all over again, now that my kids are starting to read and able to sit through us reading chapter books to them. I tend to want to read one book all the way through before starting another one. And these prints are adorable! I especially love the bottom one. oh... I so love children's books and their illustrations, especially if they're watercolors! I love reading and when I do I normally have more than one book going (a bit like my sewing projects). Thanks for the chance to win such a lovely print, how I wish it flew to Ireland! one at a time or i might start merging stories together. I usually only read one at a time, but I sometimes start one and then stop it to start another. I love to read- but reading tends to overtake me. I ignore everything else (including sleep) until I am finished. Luckily, I am a fast reader. I read one book at a time- and then wait a few weeks to start a new one. I used to be a one book woman, but now usually have 2 since I have an iPad. I have one paper one and one e-book going. What a fun print! I can only read one book at time, but my son and daughter. They need to have one or more in every room, car, bag, etc. I always have more than one book going at a time. Thanks for hosting such fun giveaways! When I was a kid I would check out 30 books from the library and finish them in the week. I owned that summer reading club! everywhere... there can never be too many books! I have always found homes without books in every room to be off putting. We have books of every kind in all our rooms. I usually have 1-2 on the go at all times. Just like knitting projects, i am in the middle of two books right now. I try to have one type of book going at a time...so one fiction, one non fiction, one cookbook ect....LOL Thanks! I usually have a few books going...although I managed to make it on this holiday weekend trip without ANY books with me, and my sister-in-law and I don't have compatible book tastes. I'm about to break into her vampire books though; I think they might be better than never-ending football! Certainly many books at once...non-fiction, cookbook, craft book, children's book. The only thing that saves us from late fees are having my due notices sent to my inbox..and then repeatedly rechecking them out. I usually read just one book at a time, but as I am always reading to my kids it is as if I am reading multiple! That picture is gorgeous! I like to read one at a time, but my oldest daughter likes to have several going at once. That always boggles my mind. I usually read only one novel at a time, if I'm not really interested I'll put it down and usually forget about it in favor of something more interesting. But I'm always reading craft books or gardening books on the side. I do need a book in every room!! lots of reading going everywhere. we are definitely the "books in every room" club!! When I find the time to read, I like short books, so I can have a few going at a time. I feel like I am accomplishing something:). Oh I am a one book at a time kind of girl. Thanks for the chance to win! I can't figure out how to post - apologies if this is my third!! One book gal who loves reading whatever the one book is to finally fall asleep... so great. Love the prints Aileen!! And thanks to both of you for this contest! I like to have a few books going! When I was working I would have one at home, one at work and an audio book in the car to get me through my commute!! With my lovely new stay-at-home-mom status, I'm down to just one book at a time, with the occasional two if I pick up a new book that I can't wait to start. Me, I usually have two on my KIndle at a time and a few at my bedside. 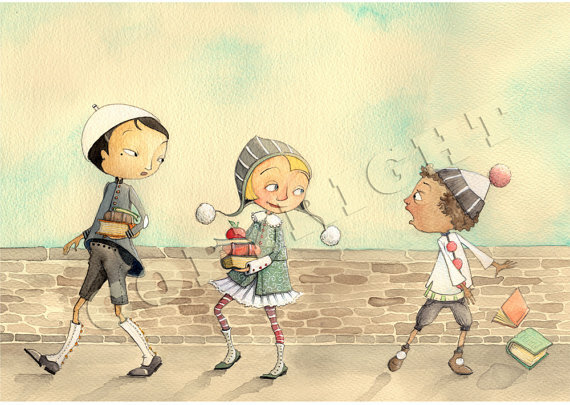 I love these illustrations and would be thrilled to give one to my little niece for her first Hanukkah. What a beautiful drawing! I, too, would love to see this outfit make its real-world debut here. Books... I think I'm a many at a time reader. Truthfully, though, I can only commit to one at a time, leaving all the rest to gather dust and library fines. Love the way you inspired a topic for all these comments! I find myself reading each one. Just one at a time. Although I read so much in college that even now many years later I still get queasy when I think about reading anything lengthy. I usually read one novel at a time, but have all kinds of non-fiction books going at once, some for my job (high school history teacher) and some for my masters course. lately i've got a book in every room, although it drives me crazy. I read only one book at a time BUT I always have my NEXT book picked out!! I love to browse all my new books at first and then choose one I like most to read at a time. These are wonderful! I'm a librarian and I usually try to read one at a time, but sometimes I just can't help myself. Thank you for the opportunity to win such a unique prize;especially for a reader! I try to read one at a time, but end up losing them and moving on to something else. That would be my disordered life! Thanks for the chance--my kids definitely read like that. When I was younger I was a bookworm and could juggle several books at a time. Now being a working single mom to 2 toddlers I can only handle 1 book at a time! i can handle more than 1 book at a time, but i like to focus on what i'm reading. As with quilting, I have several reading ventures happening simultaneously. I check out a few books at once but usually read them one at a time. I prefer one book at a time,but I always have LOTS to choose from! I like to have one book going at once, but do have how to books going at the same time. One at a time for me. But I am super fast, so I probably get through 3 a weekend. I can only read one at a time but I always have at least three or four waiting to be THE next book I'm going to read. I have 2 or 3 that I read and then about a dozen more that I read to/with my 2 kids. We love stories and books at our house!